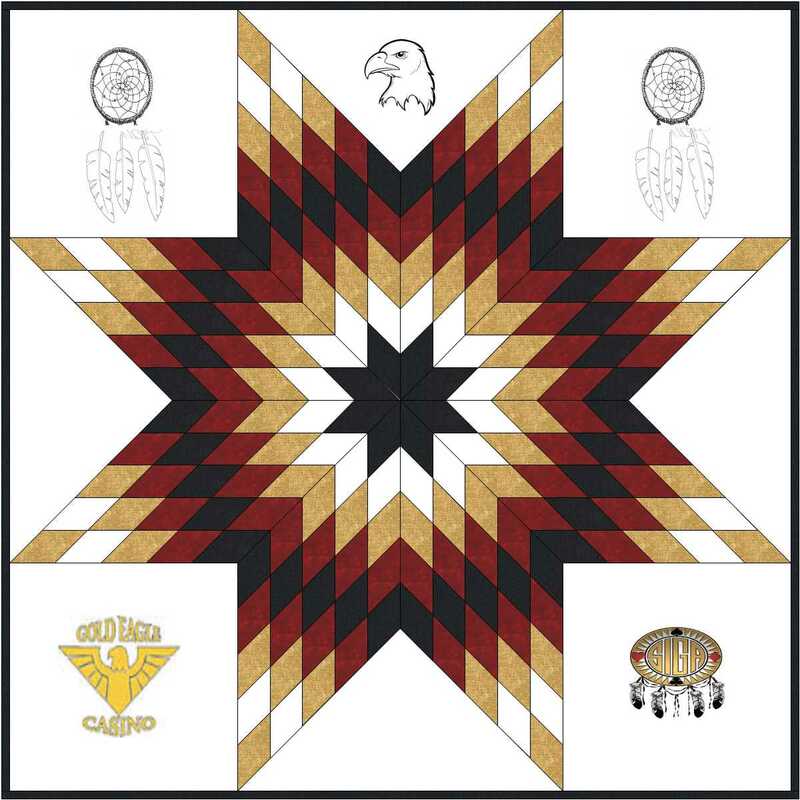 You seam to have birds & feathers going here so why not quilt feather patterns. If you are doing it freehand you can make them fit into all the blank spaces. The easiest background fill would be to cross hatch the background matching the lines up with the star diamonds. ... or do a tiny small stipple but stop about 1/4" from the motifs. I agree with the cross hatch too! 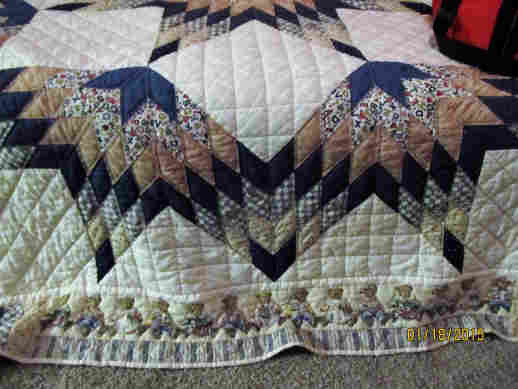 I like the cross hatch idea too after you first outline both your quilting motifs and the embroidery work with about a 3/8" from edge line. That will set them apart from the cross hatching. I like the idea of cross hatching but I would fill in the side and bottom triangles with the same eagle motif you used in the top. Have them mirror images on the sides and facing the other way on the bottom from the top. 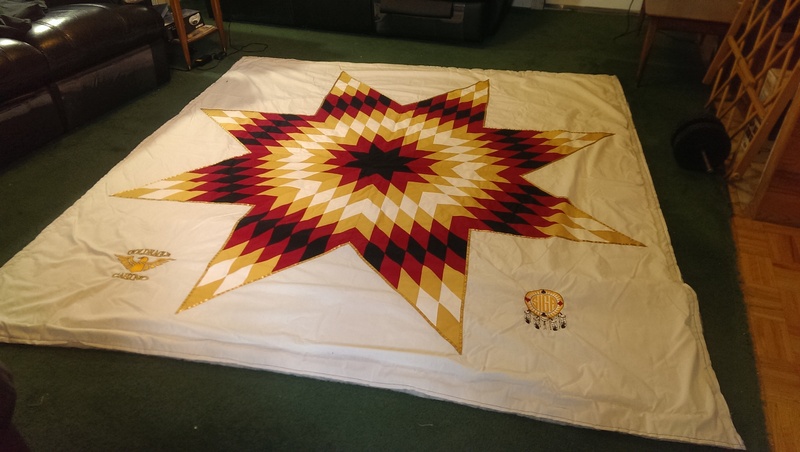 The diamonds were pieced together, then they took a big white piece of material and laid the Star on it and sewed it down with yellow ribbon...This has been a challenging quilt, it is all Polyester and the bottom embroidery wasn't done very well as it really pulls up the material. So I'm thinking once I'm down to those corners, there might be some issues. Last edited by QuiltnNan; 02-17-2019 at 05:53 AM. 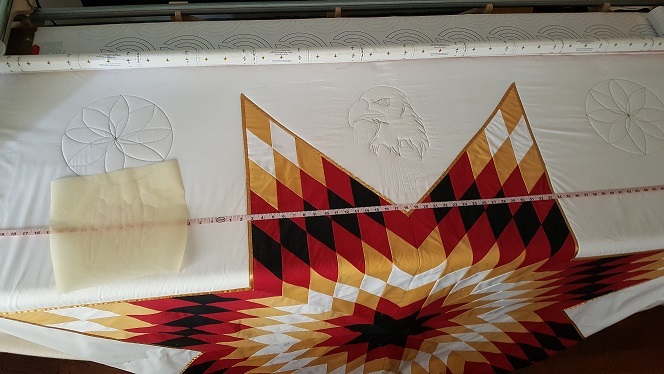 If you do an echo around the embroidery first, it may help the rest of the area lay flat. Yes Cari, I'm sure hoping that is the case.